Here are two striking and (I think) attractive Blechnum hard ferns. Colenso’s hard fern, Blechnum colensoi. 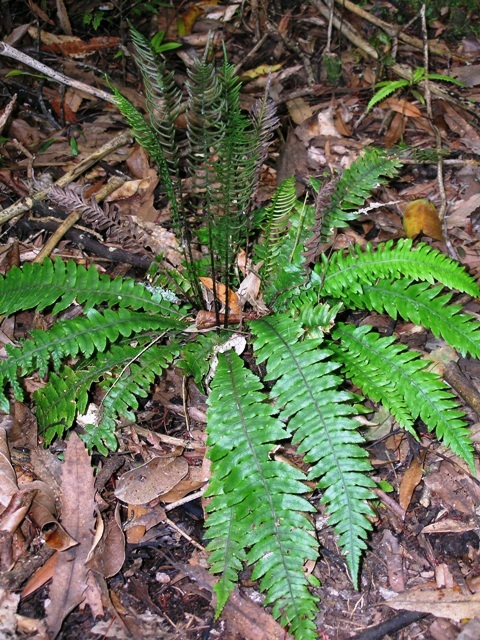 A medium sized ground fern with dark-green fronds, few frond segments for its size, and the frond segments are not stalked. © Leon Perrie. Black hard fern, Blechnum nigrum. A small ground fern. Its fronds are very dark-green, almost black, and the apex is enlarged and rounded. © Leon Perrie. Nigrum is Latin for black. Colenso’s hard fern is named after William Colenso – printer, missionary, politician, and naturalist – altogether a very extraordinary person. Biography of William Colenso. The “hard” part of the name comes, I presume, from the texture of the frond; most species are fairly rough and almost leathery. 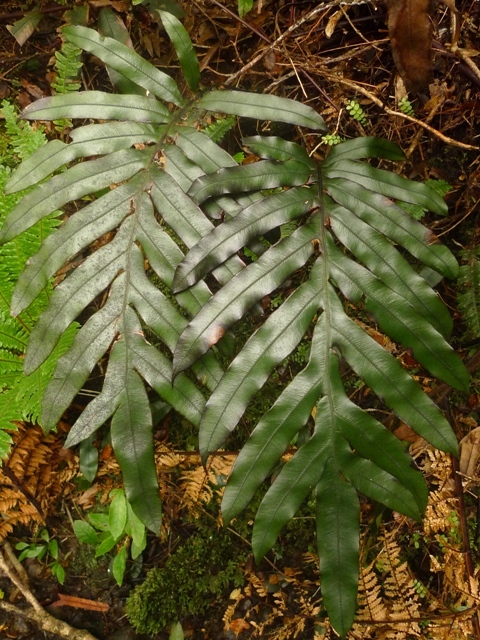 Both Colenso’s hard fern and the black hard fern are found in wet, shaded, and usually cold habitats. The above photographs were taken along the Mangahao Makahike Track near Levin. Although at a relatively low altitude, it nevertheless provides good conditions for these species. 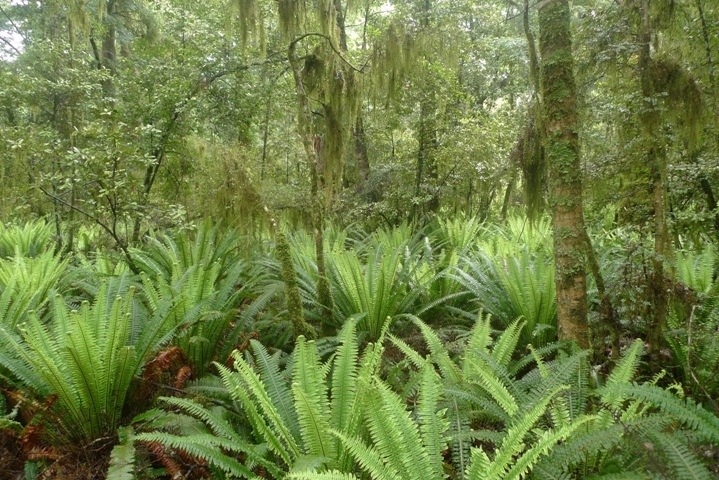 Blechnum is one of the biggest fern genera in New Zealand, with 18 indigenous species. They are easily recognised because almost all have dimorphic (different looking) fertile and sterile fronds. The fertile fronds, which make the spores , have much thinner segments and are black or nearly so. They are also often held up above the sterile fronds. The following are some of the more common species in New Zealand. Chambers’ hard fern, Blechnum chambersii. A common, small ground fern of forests. © Leon Perrie. Creek hard fern, Blechnum fluviatile. 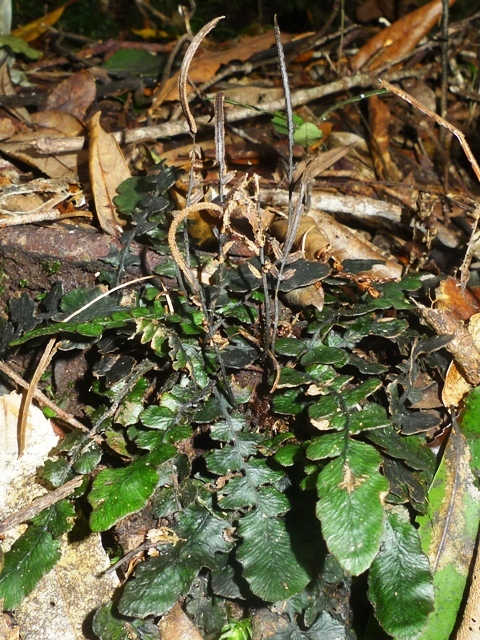 A common, small ground fern of forests. © Leon Perrie. Crown fern, Blechnum discolor. A medium-sized ground fern, with a distinctive shuttlecock-like appearance. Can dominate the groundcover over large areas within forests. Photo Leon Perrie, (c) Te Papa. Kiokio, Blechnum novae-zelandiae. 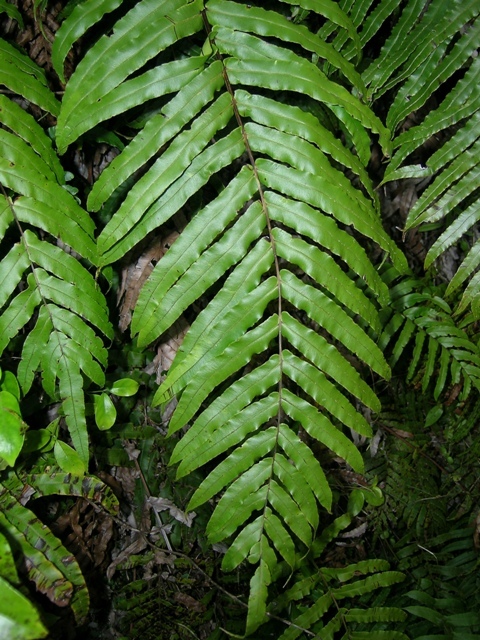 A medium to large ground fern. One of the most common ferns in New Zealand. Often seen hanging from hillsides, cliffs, and road-cuttings, but also common in swamps and forests. © Leon Perrie. 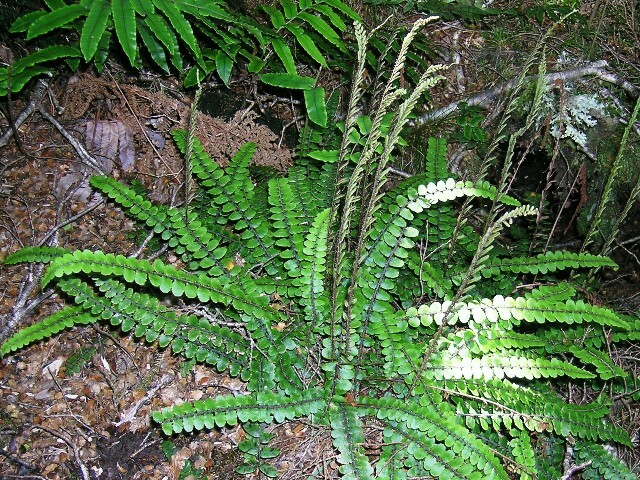 Our investigation of how New Zealand’s hard ferns are related to one another. I’m pleased you found our previous work on Blechnum useful. I look forward to seeing your results from the Philippines. We’ve our own characteristic greens too. My colleague, Patrick Brownsey, thinks it took some time for early European painters to adjust to the greens of New Zealand. Early paintings are often in the ‘wrong’ greens for New Zealand’s plants and landscapes.